Teaming up with the team at Convince & Convert, Vidyard’s VP of Marketing Tyler Lessard hosts the Content Pros Podcast. For this week’s episode, Tyler shared his own knowledge with Uberflip’s Randy Frisch about video marketing, and how a new focus on video is changing the face of modern marketing. I test these ideas with friends and peers in the market as well as with our customers. 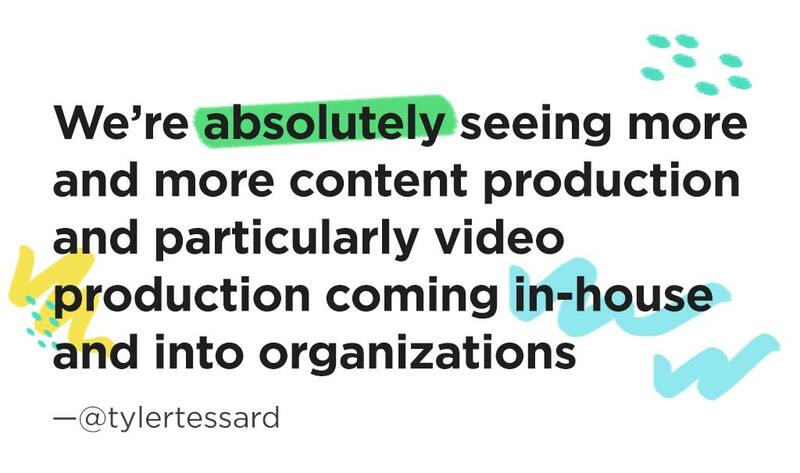 We’re absolutely seeing more and more content production and particularly video production coming in-house and organizations. The traditional approach for businesses was if you’re creating a video asset to just stand alone as a promotional piece or to be a part of some other campaign or program, the default was we’ll upload it to YouTube as a place to host that video because it’s free and it’s easy. It would be on your YouTube channel, but it would also be on your website. In a lot of cases, that’s a good start to what you’re doing and obviously it’s nice that it’s free and very simple to manage as an organization. But, one of the challenges now we’re facing is as video is becoming a more integrated part of these different programs that we’re doing, it’s not a one-off kind of brand thing. And so, it’s the notion of being able to host and distribute those videos in a way on your website that you can brand the experience, that you could create interactive content that would ask them questions or have calls to action to do something next but also in a way that enables you to track and know who’s actually watching what content and using that data back as part of your organization. I’d say YouTube is still very important as a distribution channel so we encourage everybody to still post their videos to YouTube because people may find you there. How often video production being done in-house these days versus externally? It’s definitely a growing trend that we’re seeing. It’s not just because I’m biased with respect to my role in the industry but it genuinely is happening. I test these ideas with friends and peers in the market as well as with our customers. We’re absolutely seeing more and more content production and particularly video production coming in-house and organizations. It’s been exciting to see a lot more people with journalism backgrounds coming in-house into content marketing roles, seeing writers and folks from a traditional writing background coming in to do these things. But, yeah, we are seeing it follow suit with video now.